Wow. Very nice drawing. Both characters are so pretty! Cute and sweet story so far. Love that he's not a jerk. Can't wait to read more. Hallelujah - finally a good story where the guy's not an a-hole...I swear these are so hard to come by these days. There were a number of instances in the story that felt so refreshing in comparison to the cliche scenes from other stories. For example - the girl bumped into two strangers (men) on the street. Typically they'll automatically try to pick her up but in this case, one of them were actually "human" and told his friend to leave her alone. The guy is genuinely considerate through every single interaction with the girl and never does anything against her will...gentlemen really do exist. Not only do we get a perspective into the girl's life but also to the guy's as well so readers can better understand the two. I'm loving this - can't wait for the next chapters. I'm really excited for this one. The art is lovely and I'm looking forward seeing how their relationship plays out. Sure we get a lot of stories with the shy types, but this main character is a lot more reclusive than the usual. There's only the first volume when I'm writing this, so it's hard to give it 5 right off the bat, but I've low-balled scores before on series I end up really loving so I'm going to hope for the best. Hope this continues soon! Ok so I was unsure of where this was going, it was kinda slow during the first chapter. I think that was so we could get a good idea of how crippling the h's phobia is, if it's even that, idk. But I feel like I didn't get a good read on the H until chapter 2. He seems yummy. I'm gonna guess he's the type of man to want to fully possess a woman; mind, body and soul. Am I cool with that in real life? Heck no. In my manga, yes please! We're getting introduced to more side characters and I'm really curious to find out how important they are to the rest of this story. It seems like the H is totally smitten with the h, so that's promising, cause I don't want no heartbreaker. Especially since I don't think our h's little kokoro could handle it. Art is super pretty and this story has a bit of a mysterious vibe to it, b/c I don't know who all the players are or their motives. Is it just a simple love match with a fearful h? Or is it more complicated? Can't wait to find out! I really like how the story is progressing so far. The heroine is different from the norm due to her shyness talking to people, but I love how the guy makes the effort to approach her based on her level of comfort. Plus, the art is amazingly well drawn. I can't wait to read the next chapters! Honestly a waste of money. No action and the heroine is a total dumbass. No solid characters and no solid plot line. Story is cute and scenes are hot! The artwork is drawn extraordinarily well. Waiting for the next chapters to come out! This manga is good! The characters are well drawn. I love that Kou is a gentleman and he doesn't force Mei to do anything she doesn't want. Things are getting intense at the end of vol. 4, can't wait for the next update! Really love this manga. 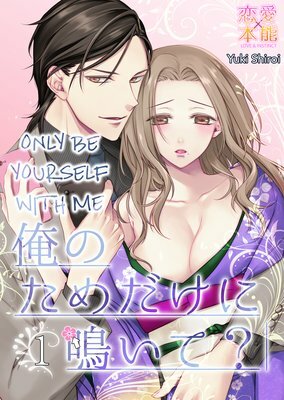 The art's very pretty and delicate, and the main guy is so sweet with the heroine, pretty refreshing after all the more forceful types. I thought the plot would be pretty simple, but it looks like it'll be picking up from the end of chapter 4. Excited to read more!